Washington’s own Noah McConahy had never ridden a 250F as a professional racer. At 6’2’’ and around 195lbs for much of his career, it’s easy to see why the smaller engine wouldn’t have been his first choice. However, this season Noah finds himself racing the 250SX West Region on a JMC Motorsports Husqvarna with his teammate Chris Howell. The two riders are the only privateers racing the Swedish brand and it’s helping them stand out in a stacked West Region. The Northwest based team travels to the races with two vans, sets up some E-Z Ups, banners, and tables and then races with the factory guys. McConahy also added that if he didn’t have this opportunity to travel to the races that he would be mowing lawns with his brother from 5 a.m. to noon. This fact is giving McConahy some added motivation this season. McConahy has been riding better as the season has progressed making main events in Glendale and Arlington, but he knows he’s got more in the tank for Santa Clara. We caught up with him on Tuesday afternoon to try to get to know him a little bit better. 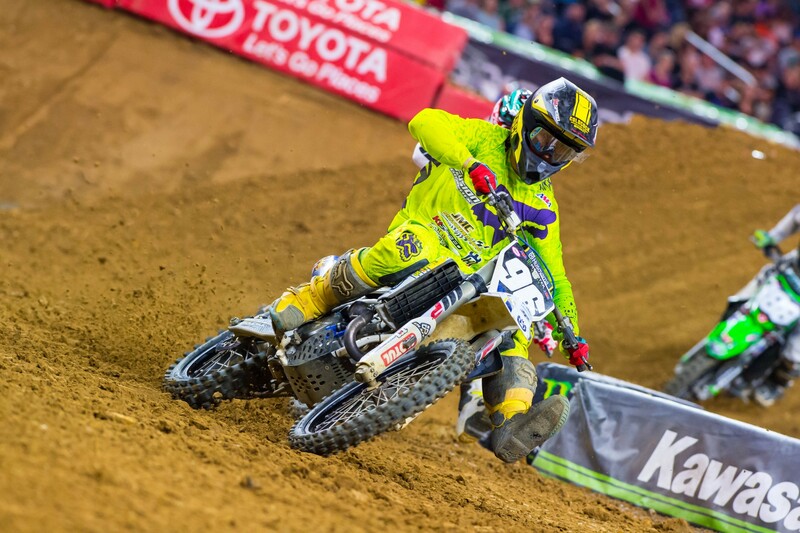 Racer X: What’s going on, Noah? Noah McConahy: Not much, man. I’m just about ready to head to the track. How are you doing? I’m doing well, thanks for asking, but I wish I were heading to a track like you. It’s actually cold for California today. It’s about 40 degrees this morning. It’s some Washington-like weather today and I do not like it. I came down here for the sunshine and not the cold rain! At least you’re used to it growing up in Washington. So, let’s get to know you a bit more. 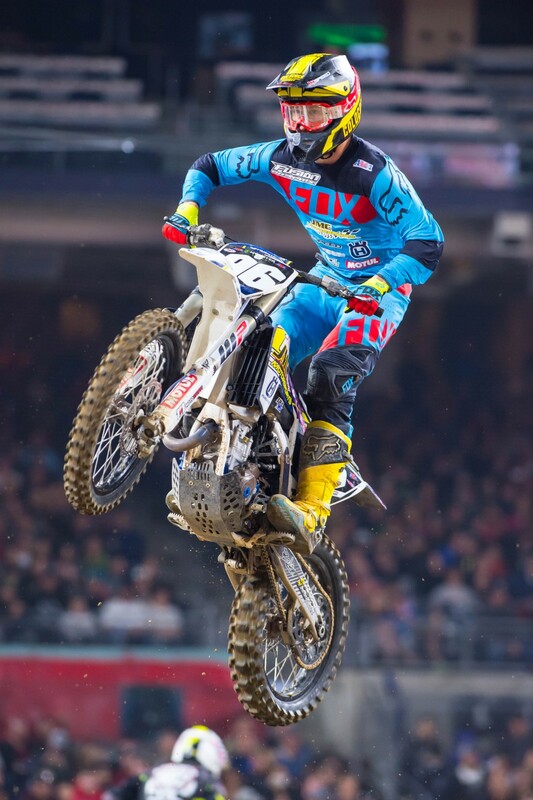 You’re riding a 250 for the first time in supercross and it’s going pretty decent so far. What do you think? I’ve always been a bigger guy. I’m 6’2’’ and I weighed around 195 last year. I had an opportunity with Joel from JMC Motorsports back home in Pasco, Washington to ride 250SX West. I really wanted to discipline myself and I dropped down to 175lbs. The Husqvarna is a fast 250 as it is. I feel like I’m not too big on the bike, I really like it, and this year has been the best year I’ve ever had. I feel really good before Santa Clara right now. I’m ready to race it. Joel is an awesome guy. They’ve always been into supercross and motocross. They’ve helped out Chris Howell in the past and now. After outdoors last year Joel, Chris, and I came together to discuss everything and here we are. I’m pumped with it and I couldn’t ask for a better program. You two are also the only other Husqvarna’s out there other than the factory team, which is pretty cool. To be honest I’m surprised at that. I took a leap of faith when I switched, but honestly the first day on the bike I knew it was the right choice. You look at Husqvarna and they are a pretty tight knit company next to KTM. One thing I wanted to be a part of was to be with a company when they were revamping. Husqvarna is a hands on company at the races. They help out at the races and we feel like we know them. That’s what I want to be a part of. It’s a really good bike and I’m surprised not more privateers ride them. I’m pumped because we are the only ones. It separates us and we stand out a little bit. I’ve noticed your setup looks great with the Fox gear on the white bike. It looks clean. Fusion Graphics has been doing a really good job keeping the bikes look great every weekend. They’ve been helping us out a lot. I think they designed a pretty clean bike and that’s what our goal was. What is the team setup at the races like? Right now I have a cube van and Chris has a sprinter van. We park those neck and neck to one another and we have a few easy-ups and Fusion hooked us up with some banners. We try to look legit as possible with the budget that we have. Our goal was to have the privateer look, but also look clean. We have the best bikes, in my opinion. We do the best we can with two vans. I like the ‘’chip on my shoulder’’ type of feeling that I get as a privateer. I like beating the guys in the big rigs. That’s a good feeling. If I get a chance to be under a semi of course I would take it, but I really don’t mind where I’m at now. It humbles me and it motivates me all at the same time. Let’s switch gears here and talk about the recent break you had from racing. Did you get to do anything fun with your family or anything? I went home for a week and hung out with my family. My nephew just started riding his bike again. It was fun to do the Northwest National Series up in Pasco as well. I worked with my trainer Kevin Urquhhart too. I started training with him after Anaheim 1 and every week we’re making huge progress. After one week at home I knew it was time to get back to work, so I came back down to California. I’ve been doing some riding at Glen Helen and WP has been helping out with some settings. We’ve just buckled down the past two weeks and we’ve stepped it up another level. My conditioning is better and I’m excited. Kevin is an awesome trainer. I really want to show everyone how hard we’ve been working. I have no pressure because we just go ride our dirt bikes and have fun. That’s what it’s all about. I take pride in the fact that I’ve worked a couple jobs. I like to work. That’s the way I was raised. A lot of privateers say that the pressure to perform gets to them and they struggle. It’s cool to hear you say that you’re keeping it fun. That pressure was always my mindset for the past couple of years. The first day that I started with Kevin he just started helping me mentally. Mentally I didn’t have any confidence. I wanted to be up there, but now it doesn’t matter who is in front of me. I don’t think about it I just believe in my program, bike, and myself. That’s what you’ve got to think about. You can’t think about the people you want to impress. Sometimes we privateers focus a little too much on beating the factory guys. I just want to have some battles and have fun. How close are you and Chris now that you’re teammates? Chris and I only live about fifteen minutes from one another back at home in Washington. Our riding crew includes Chris, Brad Nauditt, Ryan Breece, and myself. We’re all pretty close and we train together too. It’s honestly the perfect Northwest crew you could put together. Chris has had an awesome season so far. It’s cool to see how everything is panning out. Do you have any new goals as you head into the remaining rounds? I’m a firm believer in not having expectations. My speed has been really great recently. I know I’m capable of a top ten and that’s where I know I can be. It’s all about baby steps in getting to that spot. I don’t want to go through the LCQ and I want to get it done in the heat race. I just need to focus on one lap at a time and one race at a time. I don’t want to focus on one position. Today the focus is riding Elsinore and not on riding for a top ten. Santa Clara is going to be fun though and I can’t wait! The last three West Region rounds I did really well. It was hard to watch the East rounds. It’s fun to watch though. It motivates me to go and train. Now we have one race and we have to sit around until Las Vegas. You’ve mentioned to me that you’ve worked with your brother mowing yards. A lot of privateers work to support their racing, so it’s always cool to hear how you guys make your racing happen. I take pride in the fact that I’ve worked a couple jobs. I like to work. That’s the way I was raised. It motivates you to ride as well. It’s so much easier to wake up and do a workout than it is to mow lawns and then go ride. We’re a hard working family. My brother supports my racing and he gave me a job to support my racing. That was a big help. What do you like to do in your spare time when you aren’t training and riding? Please don’t say mountain biking! [Laughs] My dad played college basketball and I grew up playing basketball and not racing. I know you didn’t want me to mention it, but I’m really good at cycling. I don’t know if it’s the tan lines or what. It’s just fun. My brother and I like to go on hunting trips. My brother is like Bear Grylls. I’ll relax and watch him kill stuff and cook it. The Northwest is country and we have a lot of hobbies. I like hanging with my family. I build jumps for my nephews that will basically hit anything I tell them to hit. My one nephew is on a strider and I built him a whoop section. He’ll try to blitz it. It doesn’t matter if he crashes. That’s the best hobby because I don’t have to crash I get to watch them crash. [Laughs] I’ve got a close family. It’s just dirt bikes, family, and training. Thanks for chatting with me today, Noah. Who would you like to thank? JMC Motorsports, K1 Speed, Gee Automotive, Husqvarna, Devol, Motul Oils, Future West Moto, Acerbis, Adrenaline Designs, Airway MXP, Coldcock Whiskey, DT1 Filters, Dubya Wheels, FMF, Fusion Graphix, Guts Seats, HRMC, MotoConcepts, Moto Stuff, Motool Slacker, Natures Bakery, Pro Pegs, Streamline Levers, Relax Attire, Bulldog Training Facility, and Perfect Edge Lawn Care NW.